Three-dimensional space is a geometric model of the physical universe in which we live, work and are now entertained. Television manufacturers are quickly working to release the 3D-capable broadcasts that cable and satellite providers are already offering. For example, the 2010 Masters will be broadcast live in 3D on CBS, April 8-11. 3D movies used to be a rarity, but are now found weekly in theaters across the nation. Physical 3D models have been used for decades to visualize City improvements in need of public approval and to help architects portray their ideas to the owner. Topographic contour maps have been used to visualize ground terrain in a two-dimensional environment for drainage studies, military strategy planning, city planning, etc. These models are often costly and take too long to construct. Printed renderings are more easy and cost-effective to produce, but they lack the interactiveness of even the physical models. The recent developments and adoption of Building Information Models (BIM) and intelligent 3D models have enabled architects and engineers to reach beyond just building a “pretty picture”. These “intelligent” models serve as a collaboration tool for designers working on different aspects of the project to visualize their designs and avoid any clashes during construction. Once the project is complete, this data can be used for detailed asset/facility life-cycle management. The industry is now relying more on the virtual 3D models for design and construction and less on the typical 2D plans. However, we are still faced with the dilemma of having a working document that we can physically touch that represents the latest design. 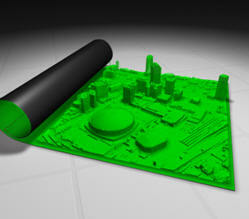 If only there was a way to have the best of both worlds – a 3D model on a 2D printed plan. 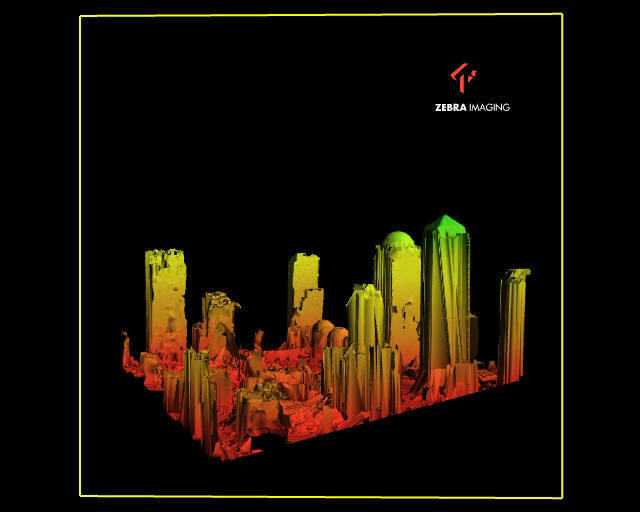 A while back I stumbled across Zebra Imaging through Twitter and after spending a day at their facility in Austin, Texas, I believe our industry is about to change. They produce full-color printed holographic images that can be used for numerous visualization applications including military planning project and concept demonstrations for investors. 3D is now a standard output for most CAD systems, and is commonly used for viewing terrain data and built environments. 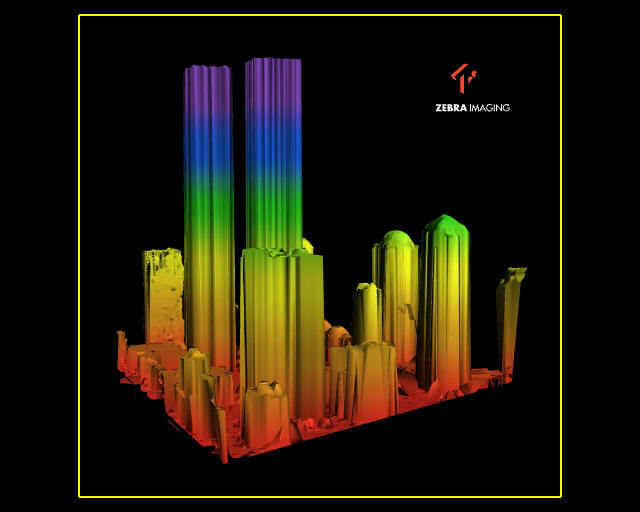 ZEBRA Imaging offers a product that allows you to view this data from more than one angle, without having to redraw the images on a computer screen. ZEBRA Imaging provides fairly large – 600mm by 800mm – flat media holograms. They are portable and can be created using a number of data sources; most importantly, they don’t require special tools (e.g. glasses or scopes) for viewing. The holograms are used in a variety of ways, including military visualizations, project presentations and concept demonstrations for investors. Monochrome view of New Orleans showing the Superdome. ZEBRA’s capabilities also include the ability to produce holograms that change depending upon the viewer’s angle. This is beneficial when attempting to depict varying levels of a building, terrain, etc. It is also helpful when trying to portray a particular image before and after an event. 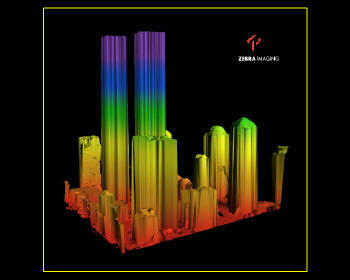 For example, Zebra created 3D visual of the Lower Manhattan skyline before and after 9-11. From one angle, a view of the Twin Towers before the disaster can be seen and from another, the rubble in the aftermath. The four images below were used at the GEOINT Symposium to show the same corner at four different time periods. Each time the corner is viewed, it shows a different aspect of the structure. ZEBRA Imaging showed this example of generals looking at an urban area. 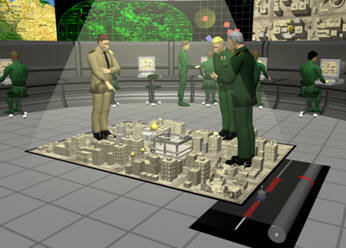 The entire image is a color hologram – including the generals, the people in the background, etc. Viewing a Zebra Imaging hologram is a viewing experience that is impossible to appreciate with the 2D limitations of a computer screen. The videos below give you an opportunity to understand how the real-world Zebra holograms appear through the lens of a 2D video camera. 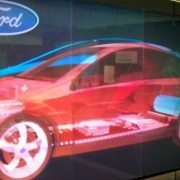 This image shows an interesting real-world application for the Ford Motor Company. The first movie shows an interesting real-world application for the Ford Motor Company. This image shows the interior layout of a specific car. A map is a model of reality that allows you to see, understand and analyze geography. ZEBRA Imaging’s offerings extend this model in a most interesting and utilitarian way.